Watkins Glen, NY – On March 16, 70 individuals charged with disorderly conduct violations were scheduled for 5 p.m. arraignments at the Town of Reading Court in Schuyler County. All had been arrested between January and March at one of several peaceful protests against gas storage at Crestwood Midstream. The court was unable to process this large number of defendants in a timely manner, and the courtroom itself, which holds 48 people, could not accommodate them. The court clerk ushered those with appearance tickets into the courtroom in small groups organized by date of arrest. This protocol compelled the remainder—including their loved ones, supporters, and assorted observers—to wait outside in the elements for up to three hours, even during severe rain, hail, and lightning. While court was in session, Schuyler County Sheriff’s deputy J.D. Sworts locked the interior front door of the Reading Town Hall, in which the courtroom is located, and allowed no one into the public building (other than to briefly use the restroom), even though the town hall contains a large meeting space that could have provided shelter during the serious weather event that began shortly after 7 p.m. The appeals of defendants locked outside of the building—who could be heard imploring Deputy Sworts and Town Clerk Alice Conklin to allow them to seek shelter inside the town hall while waiting for their turn before the judge—were audible to those inside the building. Deputy Sworts advised individuals waiting outside to take refuge inside their cars. However, many defendants had carpooled and did not have cars on site. Others had been forced, by restrictions on parking, to park up to a quarter-mile away. Further, had they sheltered in their cars, defendants might have missed the calling of their names and risked a bench warrant for arrest. By 8 p.m., courtroom decorum had completely broken down. Defendants, their supporters, and their attorney, Sujata Gibson, appealed directly to Judge Raymond Berry to allow those waiting outside in an electrical storm to enter the building. In all cases, these requests were denied. Judge Berry claimed on the record that the sheriff, and not the Court, was responsible for the scheduling snafu and that the “town fathers,” and not the Court, were responsible for the decision to declare the interior of the town hall off-limits to defendants waiting to appear before him. By 8:30 p.m., 42 individuals had been arraigned before Judge Berry, and defense attorney Sujata Gibson entered a global plea of not guilty for the remainder. We Are Seneca Lake objects both to the reckless lock-out of defendants, who had no choice other than to appear at court at the assigned hour, and to the negligent scheduling that set the stage for such chaos. This is not the first time that the town hall (courthouse) has been declared off limits to defendants and their supporters during court hearings that take place during hazardous weather conditions. We assert that the physical safety of defendants is a prime responsibility of the court system. With the help of our attorneys, We Are Seneca Lake is now exploring the possibility of filing a motion to transfer cases to a court that can safely accommodate all defendants, their supporters, and members of the press and public, with a law-trained judge outside of Reading Town Court. We are also exploring the possibility of filing a federal lawsuit for violation of due process under the Constitution. The We Are Seneca Lake campaign opposes the expansion of gas storage in abandoned lakeside salt caverns owned by Crestwood. Since the campaign began in October 2014, there have been 537 arrests. Of these, 234 cases have been adjudicated (resulting in 176 total dismissals to date); 303 cases remain open. On March 15, Judge Raymond Berry dismissed 112 violation trespass charges against 110 We Are Seneca Lake protesters after an investigation by Schuyler County District Attorney Joseph Fazzary determined there was insufficient evidence to prosecute them. Watkins Glen, NY – In Schuyler County’s Town of Reading Court, Judge Raymond Berry has dismissed 112 violation trespass charges against 110 We Are Seneca Lake protesters, according to an email sent Tuesday afternoon by Reading Town Clerk Joyce Ameigh to We Are Seneca Lake Attorney Sujata Gibson. This ruling makes official a request to Judge Berry on February 10 by Schuyler County District Attorney Joseph Fazzary. Last month, Fazzary asked the Judge to drop the charges for cases where his investigation determined that the defendants either were not trespassing or there was insufficient evidence to prosecute them for trespassing. The most recent dismissals come after months of discussions between the prosecution and defense attorneys, who have long argued that most of the protests have taken place on public property and could not involve trespass. In his motion, the District Attorney said that he had reviewed the evidence and agreed that the 112 charges he moved to dismiss should not be prosecuted for trespass. Defense Attorney Sujuta Gibson said that, while she is pleased with the 112 dismissals, she believes that “all of the trespass charges should be dropped now that it has been established that the property line was unknown and inaccurately marked at the time of the arrests.” Discussions and motions continue for the remaining defendants. We are Seneca Lake will hold a rally and press conference outside the courthouse in advance of Wednesday night’s arraignments to discuss the recent dismissals and recent ongoing arrests. When: Wednesday, March 16, 2016, 4:30 p.m.
Who: We Are Seneca Lake Attorney Sujata Gibson; Green Party leader and former gubernatorial candidate Howie Hawkins; other defendants facing charges. Read more about the arrested protesters at http://www.wearesenecalake.com/seneca-lake-defendes/. Watkins Glen, NY – The fight over the fate of the Finger Lakes became national today when best-selling author, environmentalist, and founder of the international climate campaign, 350.org, Bill McKibben joined the opposition. McKibben, 55, was arrested this morning with 56 area residents as part of an ongoing civil disobedience campaign against proposed gas storage in Seneca Lake’s abandoned salt caverns. This is a developing story. At this writing, all 57 arrestees have been charged with disorderly conduct and released, except for Bill McKibben, who is still in the custody of the Schuyler County Sheriff’s Office. Organized by the direct action group, We Are Seneca Lake, the protesters formed a human blockade on the driveway of the gas storage and transportation company, Crestwood Midstream. During the blockade, which began shortly after sunrise at 6:45 a.m., the protesters blocked all traffic entering and leaving the facility. In a public statement to fellow blockaders, McKibben thanked We Are Seneca Lake for serving as a “curtain raiser” for the larger global movement to break free from fossil fuels that is now unfolding in frontline communities all over the planet: “Today and every day there are places like this where people are standing up…. This place is so important because it’s one of the places where people are understanding that it’s not just carbon dioxide we are fighting, it’s also methane, that there are two greenhouse gases and they are both spurring this incredible heating that we are seeing.… If we can hold off the fossil fuel industry for just a few more years, this stuff will never be built again. Also arrested today were eight Schuyler County residents. Among them were the Reverend Felicity Wright, pastor of Elmira’s famed Park Church, and Phil Davis, co-owner and operator of Damiani Wine Cellars on the east shore of Seneca Lake and a seventh-generation resident of Schuyler County. Ranging in age from 30 to 76, today’s protesters represented 19 different New York counties. The group was charged with disorderly conduct and arrested shortly before 8:00 a.m. by Schuyler County deputies, Watkins Glen police, and New York State troopers, and transported to the Schuyler County Sheriff’s department. The total number of arrests in the seventeen-month-old civil disobedience campaign has now surpassed 500. Crestwood’s methane gas storage expansion project was approved by the Federal Energy Regulatory Commission in October 2014 in the face of broad public opposition and unresolved questions about geological instabilities, fault lines, and possible salinization of Seneca Lake, which serves as a source of drinking water for 100,000 people. Crestwood also seeks to store two other products of fracking in Seneca Lake salt caverns—propane and butane (so-called Liquefied Petroleum Gases, LPG)—for which it is awaiting a decision by Governor Cuomo’s Department of Environmental Conservation. Read more about the protesters at: http://www.wearesenecalake.com/seneca-lake-defendes/. Read more about widespread objections to Crestwood’s gas storage plans: http://www.nytimes.com/2014/12/26/nyregion/new-york-winemakers-fight-gas-storage-plan-near-seneca-lake.html?_r=0. Read Gannett’s investigative report about the risks and dangers of LPG gas storage: http://www.democratandchronicle.com/story/news/local/watchdog/2015/06/26/seneca-gas-storage-debated/29272421/. Watkins Glen, NY – In an act of civil disobedience, seven Finger Lakes residents formed a human chain across the north and south entrances of Crestwood Midstream, blocking all traffic from leaving and entering the facility this morning. Twenty other opponents of gas storage in the Seneca Lake salt caverns rallied along the side of the highway, reading poetry, singing love songs, and sharing chocolates and roses in a Valentine’s Day-styled protest. Among those braving frigid temperatures to risk arrest was 91-year-old Martha Ferger of Dryden in Tompkins County. Ferger was arrested in a similar anti-gas storage demonstration at Seneca Lake in November 2014. All the protesters were part of We Are Seneca Lake’s ongoing civil disobedience campaign against proposed gas storage in underground lakeside salt caverns. The group disbanded before noon, and no arrests were made. The total number of arrests in the sixteen-month-old civil disobedience campaign now stands at 480. The love poems read to the lake included verses from the 19th century ode, “To Seneca Lake” by poet and geologist James Gates Percival. Protesters have been blocking the Crestwood gas storage facility gates since Thursday, October 23, 2014, including a rally with more than 200 people on Friday, October 24th. On Wednesday, October 29th, Crestwood called the police and the first 10 protesters were arrested. More information and pictures of the actions are available at www.WeAreSenecaLake.com. The unified We Are Seneca Lake protests started on October 23rd because Friday, October 24th marked the day that major new construction on the gas storage facility was authorized to begin. The ongoing acts of civil disobedience come after the community pursued every possible avenue to stop the project and after being thwarted by an unacceptable process and denial of science. The protests are taking place at the gates of the Crestwood compressor station site on the shore of Seneca Lake, the largest of New York’s Finger Lakes. The methane gas storage expansion project is advancing in the face of broad public opposition and unresolved questions about geological instabilities, fault lines, and possible salinization of the lake, which serves as a source of drinking water for 100,000 people. Crestwood has indicated that it intends to make Seneca Lake the gas storage and transportation hub for the northeast, as part of the gas industry’s planned expansion of infrastructure across the region.Note that the WE ARE SENECA LAKE protest is to stop the expansion of methane gas storage, a separate project from Crestwood’s proposed Liquefied Petroleum Gas (LPG) storage project, which is on hold pending a Department of Environmental Conservation Issues Conference on February 12th, 2015. As they have for a long time, the protesters are continuing to call on President Obama, U.S. Senators Schumer and Gillibrand, Governor Cuomo, and Congressman Reed to intervene on behalf of the community and halt the dangerous project. In spite of overwhelming opposition, grave geological and public health concerns, Crestwood has federal approval to move forward with plans to store highly pressurized, explosive gas in abandoned salt caverns on the west side of Seneca Lake. While the New York State Department of Environmental Conservation (DEC) has temporarily halted plans to stockpile propane and butane (LPG) in nearby caverns—out of ongoing concerns for safety, health, and the environment—Crestwood is actively constructing infrastructure for the storage of two billion cubic feet of methane (natural gas), with the blessing of the Federal Energy Regulatory Commission (FERC). More background, including about the broad extent of the opposition from hundreds of wineries and more than a dozen local municipalities, is available on the We Are Seneca Lake website at http://www.wearesenecalake.com/press-kit/. Watkins Glen, NY – Eleven veterans representing all branches of the U.S. armed forces, were among 13 arrested on Tuesday morning in a human blockade at Crestwood Midstream on Route 14 as part of We Are Seneca Lake’s ongoing civil disobedience campaign against gas storage in underground lakeside salt caverns. The protesters blocked all traffic entering and leaving the facility. Among them was former NY gubernatorial candidate Howie Hawkins (Green Party), a veteran of the U.S. Marine Corps. Also joining the protest were Schuyler County resident and U.S. Army veteran Nathan Lewis, who served in Iraq, and Colleen Boland, U.S. Air Force Senior Master Sergeant (retired), who served in the White House during the George W. Bush Administration. Boland served an 8-day jail sentence in November 2014 for a previous act of civil disobedience at the Crestwood entrance. At 8:45 a.m. this morning, the 13 ceremoniously unfurled banners that read, “Veterans Against Crestwood / Defending the Climate and Seneca Lake,” and formed a human chain across the north entrance of Crestwood Midstream, blocking chemical tanker trucks from leaving and entering the facility. The group was arrested shortly after 9:00 a.m. by Schuyler County deputies, transported to the Schuyler County Sheriff’s department, charged with disorderly conduct, and released. While blockading, the veterans from all branches of the military made public statements about the duty they feel to protect water and the climate. “I continue to be mindful of my past oath to protect against all enemies, foreign and domestic,” said Colleen Boland, who traveled to more than 20 countries while on active duty. The We Are Seneca Lake movement opposes Crestwood’s plans for methane and LPG storage in lakeside salt caverns and has been ongoing since October 2014. In that spirit, and as part of the ongoing civil disobedience campaign against gas storage called We Are Seneca Lake, seven protesters from six different New York counties declared their support for the residents of Porter Ranch, California, where a massive leak from an underground gas storage facility has sickened and displaced thousands of families and shows no sign of abating. The seven formed a human chain across the north entrance of Crestwood Midstream on Route 14 at 8:45 a.m. this morning. While blocking all traffic entering and leaving the facility, the group read a statement of solidarity with the people of Porter Ranch before their arrest by Schuyler County deputies at 9:15 a.m.
Today’s blockaders held banners that said, “Seneca Lake to Porter Ranch: Shut It All Down” and “Gas Storage Courts Disaster.” Porter Ranch activists use #shutitALLdown as their signature hashtag on Twitter. All those arrested were transported to the Schuyler County Sheriff’s department, charged with disorderly conduct, and released. The total number of arrests in the sixteen-month-old civil disobedience campaign now stands at 467. The uncontrolled gas leak at the Aliso Canyon gas storage facility—the single largest in the U.S.—was discovered on Oct. 23, 2015. Governor Brown declared a state of emergency on Jan. 6, 2016. Thus far, more than 2,500 families have fled their homes and more than 1,000 children have been relocated to other schools. Health officials now acknowledge they initially underestimated the scope of the gas leak and the possible attendant health risks. Self-reported health complaints include nausea, dizziness, vomiting, shortness of breath, and headaches. The methane gas storage expansion project is advancing in the face of broad public opposition and unresolved questions about geological instabilities, fault lines, and possible salinization of the lake, which serves as a source of drinking water for 100,000 people. Crestwood has indicated that it intends to make Seneca Lake the gas storage and transportation hub for the northeast, as part of the gas industry’s planned expansion of infrastructure across the region.Note that the WE ARE SENECA LAKE protest is to stop the expansion of methane gas storage, a separate project from Crestwood’s proposed Liquefied Petroleum Gas (LPG) storage project, which is on hold pending a Department of Environmental Conservation Issues Conference on February 12th. Seneca Lake Stands with Porter Ranch: Shut It All Down! Press Kit Comments Off on Seneca Lake Stands with Porter Ranch: Shut It All Down! My name is Sandra Steingraber, and I have a message to the people of Porter Ranch, California from the people of Seneca Lake. Today, on the national holiday celebrating the birth of Dr. King, we gather near the shoreline of Seneca Lake in New York State, on a simple driveway to make our own declaration. This is not just any driveway. It’s contested ground. In the last 16 months, there have been 460 arrests on this strip of pavement for civil disobedience in objection to the expansion of underground gas storage in old salt mines on the banks of our beautiful lake. Some of us have gone to jail. Today, we affirm our network of mutuality with people who live three time zones away in a California community called Porter Ranch. The wind chill on this hillside is minus one degree, and we are cold. But we know that people of Porter Ranch are suffering magnitudes more. The leak from Aliso Canyon underground gas storage facility near Porter Ranch has been pouring 1,000 tons of climate-killing methane into the air every hour for the past three months. We all share the same atmosphere. We know it’s the biggest gas leak in U.S. history. We know it’s an official state of emergency. We know there is no end in sight and there is no clear way to fix it. We know that the fumes from this single leak have sickened people and dropped birds, dead, from the sky. We know that the risk of a massive fire is so great that planes cannot fly over the site and cellphones and watches are forbidden on the site. We know that more than 2,500 Porter Ranch families have been forced to evacuate and children have been forced to change schools. Meanwhile, seven different efforts to plug the faulty well that is the source of the leak, has only further destabilized the situation, expanding a crater around the wellhead that threatens the possibility of a full blow-out. And the attempts by Southern California Gas to drill a relief well will take at least six more weeks—and may not work either. These are hard truths to hear. But we hear them. So, we want you to know that we are listening. And we, who stand right now, right here, on top of decrepit salt caverns that are slated to serve as storage vessels for massive amounts of pressurized gas echo your words back to you. Like your depleted oil field, our salt caverns were never engineered to hold natural gas either. People of Porter Ranch, we know your lives were upended because no one replaced a safety valve at the bottom of the well. We don’t believe we have bottom safety valves here either. Seneca Lake and Porter Ranch are tied in a single garment of destiny. What affects you directly today could affect us directly tomorrow. We look at the myriad injustices that you are now compelled to endure, and we see our own future. Martin Luther King urged us to confront injustice and bend the arc of history in another direction. And he gave us some tactics to use in our efforts. One of them is non-violent civil disobedience. That’s what we are doing today. We do it to amplify your own message. And we do it in the fervent hope that we can change our story, that there will be no Porter Ranch at Seneca Lake. Watkins Glen, NY – In the first action of 2016, six We Are Seneca Lake protesters from five different New York counties toasted the New Year with apple cider, resolved to continue their campaign, and called for urgent action to protect the climate as they formed a human chain across the north entrance of Crestwood Midstream on Route 14 shortly before 9 a.m. this morning. They blocked a tanker truck and a pick-up truck before their arrest by Schuyler County deputies. All were transported to the Schuyler County Sheriff’s department, charged with disorderly conduct, and released. The total number of arrests in the sixteen-month-old civil disobedience campaign now stands at 460. Protesters have been blocking the Crestwood gas storage facility gates since Thursday, October 23, 2014, including a rally with more than 200 people on Friday, October 24th. On Wednesday, October 29, Crestwood called the police and the first 10 protesters were arrested. More information and pictures of the actions are available at www.WeAreSenecaLake.com. 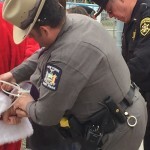 December 21, 2015 – Watkins Glen, NY – The Grinch, Santa, and his elves took a short break from their Christmas preparations today to visit the gates of the Crestwood gas storage facility to warn the company that Santa—and the world—is watching. His elves and local friends held signs saying, “Dirty energy = naughty, clean renewables = nice” and “Here comes the sun, go solar!” Santa and twelve others, including the Grinch, were arrested for disorderly conduct while stopping a truck pulling construction equipment. Their message: there’s still time to get on Santa’s “nice” list. The Crestwood gas storage facility proposes to store methane, propane, and butane in salt caverns under the shores of Seneca Lake. It is one of many projects, including pipelines, which aim to develop “new markets” for the current glut of natural gas from the fracking boom, committing people to using natural gas far into the future. Natural gas is primarily methane, a significantly more potent greenhouse gas than carbon dioxide over a 20-year timeframe. Santa and the Grinch joined many friends from the area in welcoming the return of the sun at Winter Solstice, noting that solar panels have been particularly high on the wish list requests in the area this year. Schuyler County deputies arrested the thirteen shortly before 2:00 p.m. as they blocked a dump truck pulling a mini excavator from leaving the facility. The thirteen protesters were transported to the Schuyler County Sheriff’s department, charged with disorderly conduct, and released. Crestwood’s methane gas storage expansion project was approved by the United States Federal Energy Regulatory Commission in October 2014 in the face of broad public opposition and unresolved questions about geological instabilities, fault lines, and possible salinization of Seneca Lake. The total number of arrests in the civil disobedience campaign over the past year now stands at 452. Whether due to low natural gas prices or the ongoing direct action campaign, construction of Crestwood’s natural gas storage expansion has not yet begun. Today marks the one-year anniversary of the announcement by Governor Cuomo, the Department of Health, and the Department of Environmental Conservation that New York would ban high-volume fracking given serious public health and environmental risks. The state of Maryland and many other communities have followed New York’s lead, and science and economics increasingly show the wisdom of this action, particularly as it becomes clear how much methane contributes to climate change. The Crestwood gas storage facility proposes to store methane, propane, and butane in salt caverns under the shores of Seneca Lake. It is one of many projects, including pipelines, which aim to develop “new markets” for the current glut of natural gas from the fracking boom, committing people to using natural gas in the future. Natural gas is primarily methane, a significantly more potent greenhouse gas than carbon dioxide over a 20-year timeframe. The red line motif emerged at the end of the Paris climate talks last Saturday, as 15,000 people marched in the streets of Paris. It signifies a commitment to holding society to the lines that cannot be crossed in order to avoid catastrophic climate change. Eighty percent of fossil fuels must be left in the ground in order to curb climate change. The red line motif also was prominent last weekend as 300 residents in Porter Ranch, CA demanded closure of the Aliso Canyon Storage Facility. The Southern California Gas Co. field has spewed natural gas into the atmosphere since Oct. 23. It currently contributes a full one-quarter of California’s daily methane emissions. There have been hundreds of complaints from the surrounding community of headaches, nosebleeds, stomachaches, rashes, and respiratory illness from exposure to the gas and its additives. 1,000 families have evacuated. The company estimates it will take 3 months to plug the leak. Schuyler County deputies arrested the nine shortly before 10 a.m. as they blocked a Crestwood tanker truck from leaving the facility. The nine protesters were transported to the Schuyler County Sheriff’s department, charged with disorderly conduct, and released. The total number of arrests in the civil disobedience campaign over the past year now stands at 441. Crestwood’s methane gas storage expansion project was approved by the United States Federal Energy Regulatory Commission in October 2014 in the face of broad public opposition and unresolved questions about geological instabilities, fault lines, and possible salinization of Seneca Lake. Whether due to low natural gas prices or the ongoing direct action campaign, construction of Crestwood’s natural gas storage expansion has not yet begun. The methane gas storage expansion project is advancing in the face of broad public opposition and unresolved questions about geological instabilities, fault lines, and possible salinization of the lake, which serves as a source of drinking water for 100,000 people. Crestwood has indicated that it intends to make Seneca Lake the gas storage and transportation hub for the northeast, as part of the gas industry’s planned expansion of infrastructure across the region. Note that the WE ARE SENECA LAKE protest is to stop the expansion of methane gas storage, a separate project from Crestwood’s proposed Liquefied Petroleum Gas (LPG) storage project, which is on hold pending a decision from a Department of Environmental Conservation Administrative Law Judge on whether the matter needs a full adjudicatory review. As they have for a long time, the protesters are continuing to call on President Obama, U.S. Senators Schumer and Gillibrand, Governor Cuomo, and Congressman Reed to intervene on behalf of the community and halt the dangerous project. In spite of overwhelming opposition, grave geological and public health concerns, Crestwood was given approval by the Federal Energy Regulatory Commission (FERC) in October 2014 to move forward with plans to store highly pressurized, explosive gas in abandoned salt caverns on the west side of Seneca Lake. However, despite ongoing activity on site, Crestwood reports to FERC that construction of the methane storage expansion has not yet begun.